OnLive, the system/service that renders current-gen video games in the cloud, is by no means perfect. That said, I'm shocked at how well it actually works. I think there are two main concerns running through the heads of anyone that's heard of this thing: a) Latency between your control inputs and the action on the screen and b) picture quality. While this system is still in pre-beta, and both of these aspects are inferior compared to a home console or PC experience, I still think OnLive will serve well the gamer who doesn't want to kick down the cash for the latest hardware. 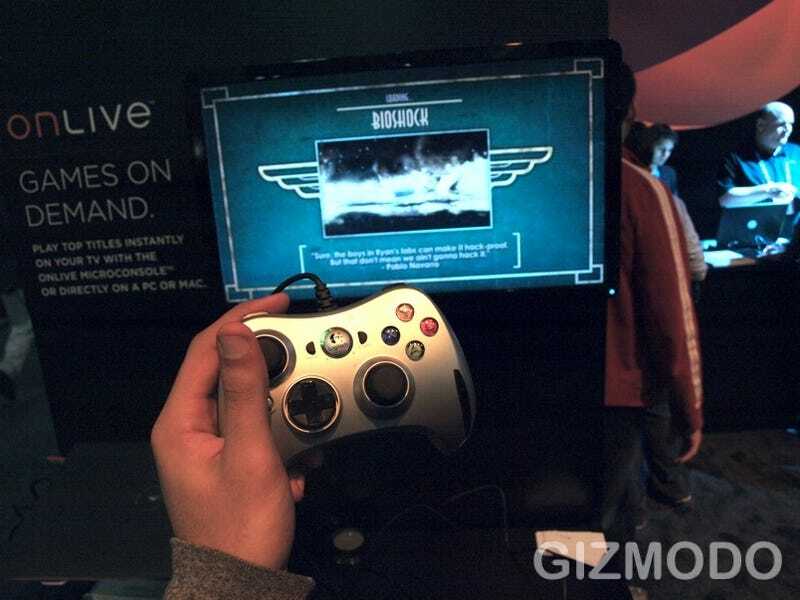 I played Bioshock using the PC setup, which involved an average looking Dell laptop, and a Logitech control pad. The game was running 50 miles away on a server in Santa Clara, and load times are pretty much the same as running the game on your PC. Once I got started with gameplay, I noticed the slightest bit of lag between controller and screen. Just enough to not feel natural, but hardly enough to really detract from gameplay. Some environments (especially indoor) were more responsive than others to the point that you barely noticed any latency. Definitely not for the competitive gamer, but for the guy who just wants to play for a few hours on the weekend, it's fine. As far as picture quality goes, there is noticeable compression and artifacting that takes place. When fire and water effects were dominating the screen in Bioshock, you pretty much saw squares everywhere. OnLive doesn't mince words about it, saying it comes with the territory, but they do expect the quality to get better over time as they hammer out the kinks. Some of the indoor textures and environments looked pretty close to running on your own console, with minor dropoffs in sharpness and clarity. The batch of screenshots below doesn't tell the entire story, but it gives a basic idea of what to expect. I also noticed some choppiness in the framerate, but whether or not it was caused by the streaming, or the server, is unknown. As for the palm-sized, set top version of OnLive, I didn't get to actually take it for a spin, but from watching, I'd say performance was about the same compared to using a PC.